Designed & tested in the big bass lakes of Florida Vursa Braid is made with a high number of weaves per inch to insure incredible strength. It is great for flippin’, pitchin’, froggin’ and everything in between! 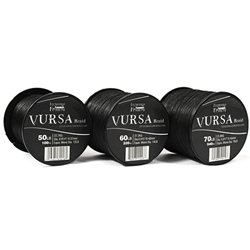 Vursa Braid is a specially engineered 8 strand braid which makes it smooth, quiet, round and extremely strong. Vursa Braid handles great, and comes off the spool extremely smooth when pitching or casting it. It is black in color so it blends in with the natural environment making it harder for the fish to see so you will get more and bigger bites. It’s also made using a proprietary process allowing it to hold its color and prevent it from fading as much as other braids. Put your trust in Vursa Braid it won’t let you down!